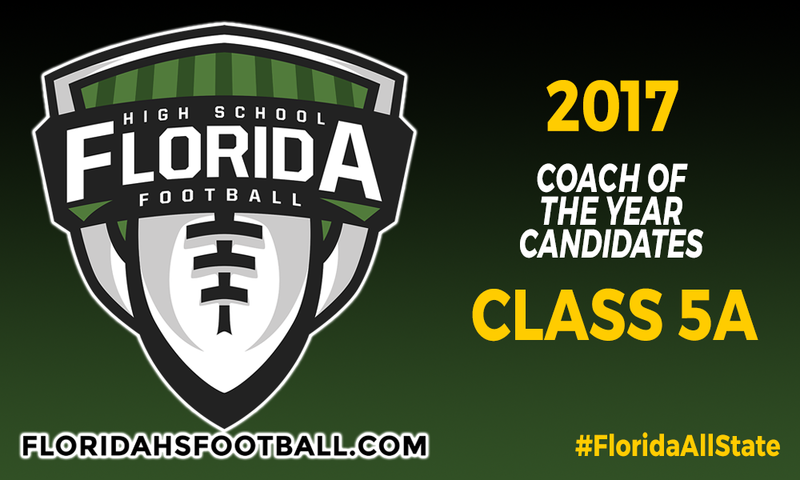 GAINESVILLE, Fla. — With the final step to fully closing the 2017 season is almost here, we are proud to reveal our candidates for our Class 5A Coach of the Year candidates. For Coach of the Year, five coaches are selected as candidates based upon the resume they had for the season. For Player of the Year, three players are selected on offense and three on defense as candidates for Offensive Player of the Year and Defensive Player of the Year. One player from each classification of the six candidates total will be selected as the Overall Player of the Year for their respective classification. EDITOR’S NOTE: Watch the first team reveal for all eight classifications including the award winners for Coach of the Year, Offensive Player of the Year, Defensive Player of the Year and Overall Player of the Year, this Wednesday night on the FloridaHSFootball.com Gridiron Report on Varsity Sports Network, starting at 8:00 p.m. EST / 7:00 p.m. CST by clicking here. • Patrick Surtain, Plantation American Heritage (13-0) – Led the Patriots to their fourth state championship in five years, and the second straight season as an undefeated team, having gone 27-0 as head coach. • Jamie Rodgers, Glen St. Mary Baker County (13-2) – Guided alma mater to its best season in school history and first appearance in a state championship game in the school’s 70-plus year history. • Rhett Summerford, Pensacola West Florida Tech (12-2) – In his first season as the head coach for the Jaguars, Summerford led his team to their best season in school history, reaching the state semifinals for the first time after knocking out four-time defending state champion Jacksonville Trinity Christian in the regional finals. • Rodelin Anthony, Immokalee (12-1) – Led his alma mater to their best season since 2012 when the Indians competed in the Class 5A state championship, leading them to the state semifinals playing toe-to-toe against defending Class 5A champions, Plantation American Heritage. • Matt DuBuc, Fort Lauderdale Cardinal Gibbons (11-2) – DuBuc lead his alma mater to their deepest playoff run since the 1994 season with arguably its most talented squad since that very same season.